In Massachusetts over 65 plant species have been identified as invasive, likely invasive, or potentially invasives. Invasives actively impact our state through the destruction of the biodiversity of the existing ecosystem. Invasives left behind the herbivores and any disease that would control their growth in their native habitats. Without hindrances such as natural predators and diseases, those plants with rapid growth and very successful reproduction, can quickly dominate and spread in its new territory, earning the title of Invasive. They alter existing ecosystems processes such as hydrology (the branch of science concerned with the properties of the earth's water, especially its movement in relation to land), soil chemistry, and through its destruction of neighboring natives, even contribute to the frequency of natural fires. 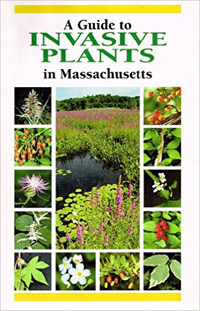 This 2008 Guide to Invasive Plants in Massachusetts includes 5 Tree species, 13 shrubs, 8 vines, 22 herbs, 8 grasses or sedges, and 10 aquatic plants. We are all familiar with the Norway Maple (Acer platanoides), a beautiful tree that is spreading into and taking over our wooded areas. It is fast growing and able to displace our slower growing native Sugar Maple and American Beech. Tree-of-heaven, Copal Tree, or Chinese Sumac (Ailanthus altissima) caught my eye in this guide book. This prolific seed producer and fast grower, can form impenetrable thickets producing toxins or growth inhibitors in the soil that affect neighboring plants, known as allelopathy. Another of the allelopathic plants is the Common or European Barberry (Berberis vulgaris). The Barberry produces abundant fruit which the birds enjoy and disperse throughout our woodlands. The seeds germinate at a high rate, and begin to dominate their new environment. In the herb and vine categories, we are all familiar with Oriental Bittersweet (Celastrus orbiculatus) and Porcelain-berry (Ampelopsis brevipedunculata), both very attractive, but also destructive to any tree or shrub it is growing on. Pulling out any Garlic-mustard (Alliaria petiolatea) has almost become second nature when we find it. One of our WMMGA members, who is much more acquainted with invasive grasses and aquatic plants, has taken on a personal crusade to rid our area of Japanese Stiltgrass.